Looking into other regions of Yunnan with hot springs, there remains the prefectures to the south (Pu'er, Xishuanbanna, Lincang) and southeast (Honghe and Wenshan). Though there is scientific credence (Xian Daxian, 1987) given to Pu'er prefecture having 17 (known) hot springs, the only hot spring mentioned is Manzhongtian hot spring which lies to the south(east?) of Pu'er prefecture's capital of Simao (Mayhew et. al., 2002).Further afield, to the west, is the county of Menglian which is home to Mengmazhen (Mengma or Mountain Mussel [!]) hot spring with temperatures varying from 26-54℃ (source). A picture here. 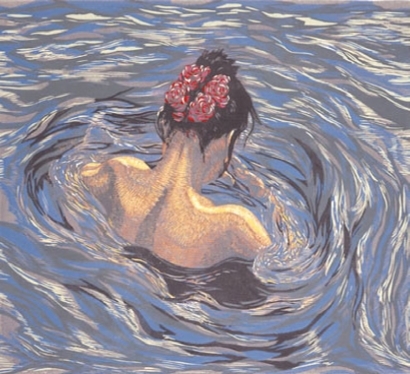 A painting by He Kun, native of Puer , entitled 'Hot Spring 3' (source). Then there is a mention of Lancang Lahu Spa by Deja Vu and Jinggu county has a hot spring in Fengshan village which doubles up with a local temple as the village's attractions (source). A picture can be found here. So that's at least four soaking sites. Lincang prefecture is home to Yuhengchang Hot Spring hotel (tripadvisor). The same source also mentions Lincang Garden Hot Spring hotel. Elsewhere there was a mention made of Fengqing county being geothermal rich. A Chinese language website refers to Zhenkang county hot spring where you can 'barbeque' yourself, i.e. make your own sauna. This website once reported that Maolan, Yun county, had at least one hot spring, with mentions of a temperature of 68℃. According to the same source referred to originally, Shuangjiang county also has a hot spring with temperatures from 52-58℃. I mentioned it looked nice. Then there's a photo on panaramio of Yunxian hot spring as well as Chinese language photoblog. 'Just boiled eggs dipped in chili powder to eat'. Xishuangbanna is reputed to have more than 50 hot springs (Xian Daxian, 1987). '... there’s an assortment of steaming hot pools you can soak in, each one with its own special fragrance (coffee, tea, rose petals, coconut milk, etc)' (source). It's going with the times, as can be witnessed by the availability of Dr. Fish treatment. It's even considered as 1 of China's most beautiful places. The accompanying info is mostly gibberish, though it does mention that the hot spring is 5 km from Jinghong. Tripadvisor notes Xiaojie county hot spring, Jinghong. 'It is a vast modern complex. The hot springs were only partially open when we were there, however they still let all the 'day trippers' in which meant they was a heaving mass of people. We didn't see any westerners there (which is a plus point!)'. Others mention that visitors should only stay here if they love hot springs as there is nothing else to do. 'In the middle of nowhere stands ultra modern buildings, a 495 acre man made ecological lake preserve filled with clean clear spring water. Their showcase piece is the Huquan Resort and Spa smack dab in the middle of this preserve. Lagoons, sandy beach fronts, natural hot springs, and water activities showcase this resort complex. The resort is “set” in water so from your room it is as if you are virtually living in the lake. This 5 star complex is about as lavish as it gets'. 'Minority “fans” usually spend one or two nights in Mile when they head for Yuanyang to witness Hani Terraced Fields. Huquan Hotel is their favorite place to stay in since natural spring spa is available inside. Mile boasts rich geothermal resources. Its Huquan Hotel enjoys the highest popularity in Honghe (Red River) Prefecture for spring spas. It is a good place for recreation and relaxation'. But none seem to match the fame or notoriety of Mengla hot spring, Jinping county. It's just how you look at it. Fame in the sense of the great amounts of links to this hot spring, notoriety as the local Dai people seem less concerned with adhering to the latest fashion whims. 'Men and women enjoying Naked Bath is a traditional custom of Dai people living in Jinping County, which makes Mengla Hotspring known to the outside world. Dai youth there take Naked Bath together while chitchatting in huddles. Sometimes they just immerse themselves in the pond, quite similar with swimming fish, a peculiar spotlighted view'. 'Yunnan, the indispensible China destination. Where karst towers draped in snarls of jungle jut out of tropical forests to stand as monuments lording over scenes from another planet. Awe-inspiring and oft photographed to be sure, Yunnan’s got something for hot springs lovers too: the Jinping Mengla Hot Spring. Issuing from the caves at 50-60 degrees centigrade, waters flush with curative elements run over colorful rocks. Visitors will find a host of curative natural effects, from bubbling waters to "masseuse rocks" that knead muscles as you simply lie there. Immediate surroundings are well worth the time to explore too. The lush forests conceal ravines, waterfalls, mirror-like lakes and karst landforms under their canopies. Accommodations can be found in the nearby town of Gejiu, 7 kilometers away. You'll find the four-star Century Plaza Gejiu ... comfortable, though the befuddled staff might leave you with a raised eyebrow or two'. Like the way they finish that segment. 'These hot springs are open, no fences, no tickets'. It comes complete with many a picture, including one of hungry male photographers! 'It merges tour, recreation and body-building into one whole'. The aforementioned were a website now no longer existing. It is also praised Yashadi for it's many karaoke bars. There's little more info here. 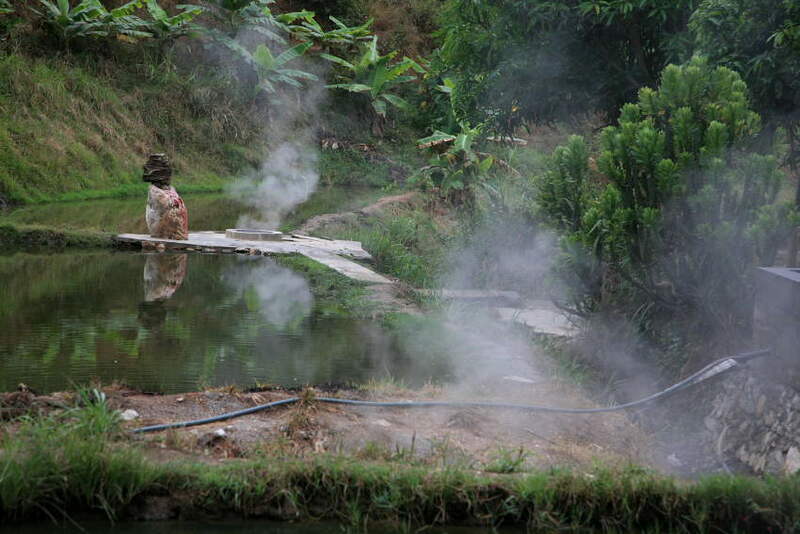 Sometimes it is is also referred to as Jiasha hot spring, the name of the river nearby. scenery and multicolored pools at the hot springs in Gejiu, Yunnan, China'. 'Wuzhe hot spring scenic spot was constructed in 1998. It occupies hot springs at 78°C at outlet, annaul hydraulic discharge 220,000 cubic meters. Because it contains many types of microelements and mineral compositions, it is appropriate for bathing'. This website adds that there are deep-water swimming pools. Less well known is Meihua hot spring which translates as plum hot spring. This website has some photo's which is in the west of Honghe. This link also recommends Xiao Qin Tian hot spring (in the northeast) and Xiao Zhai (or Small Village) hot spring. 'Besides the bathing pools with separate sections for men and women, there is also a new-built swimming pool in the open air which can be used by nearly one thousand people at the same time'. Mayhew, B., K. Miller, A. English (2002) South-West China, 2nd edition. Lonely Planet, Melbourne, Australia. Xian Daxian (1987) The distribution of hot springs and their features in Xishuang Banna and its adjacent areas. Yunnan Geology 1987, vol. 1. Kunming, China.